Q: I am in real need of your advice. I have a 15-year-old daughter who, unfortunately, has the smallest bedroom in the house. Over the years, I have tried to make the room look more spacious by rearranging the furniture, but never had much success. No matter what I tried it still looked so ramped and boring. Now my daughter is extremely unhappy with the bedroom, which she refers to as "useless." I understand her feelings, but don't know how to solve the problem. Building an addition to the house is out of the question, and the furniture that she already has must remain because it is solid maple and in excellent condition. 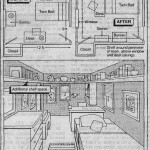 I enclosed a sketch of the room as it is arranged now. Any suggestions for even a slight improvement would be very much appreciated. A: I can understand the frustration of both yourself and your daughter. You clearly realize how important a teenager's room can be to her. She spends a lot of time in the room and wants it to be functional, but she also wants it to attractive. As you have already determined, it is difficult to achieve in a 9-foot by 12-foot room. Having to work with existing furniture makes it even more fa challenge. 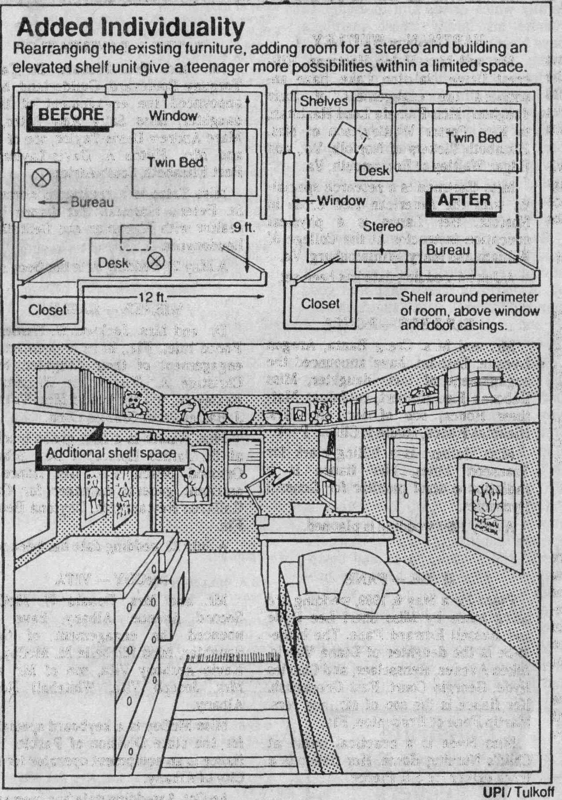 In working with the room and the furniture, I would put the bed against the 12-foot window wall, with the head of the bed against the back of the desk, which is angled out from the wall. Note that I have left room between the foot of the bed and the wall. Most bed frames are on wheels, and with this extra space, changing the sheets would not be a problem. The desk serves as a headboard for the bed, and the lamp can be used for studying or reading in bed. Both are also close to the window to take advantage of the natural daylight. Another "plus" is the fact that when she's studying, she's looking info: the room, not staring at a wall. I always feel that this is preferable. Bookcases can be mounted above theÂ desk height on the wall to the left of the window, leaving space below for the operation of the drawers. The wall at the foot of the bed is fairly large and would be an ideal spot for her to hang her posters, awards, photographs, or whatever she desires.Â They would be very visible and easy for her to appreciate when she's at he desk or in bed. I would put the 30-inch bureau on the closet wall, but close to the door into the room. This will leave enough space for her to put a stereo. She can either build shelves or buy a cabinet that would hold whatever pieces of stereo equipment she may own, plus tapes records or discs. You didn't mention i in your letter, but I haven't met a teenager yet who doesn't want space for a stereo in his or her bedroom. If your daughter has additional things that she wants to display, but doesn't often need access to them, you could build a narrow, 1-inch by 10-inch shelf around the entire room, mounted above the door and window casings. It would give her a lot of space to put all of her valued possessions, and not interfere with anything else. The space would be otherwise wasted, and a stool is all that would be needed for dusting it.. I think this arrangement of furniture provides a lot more open floor space by utilizing the dead corners. ConseÂ­quently, the room appears larger and more spacious. Even though the space is small, it should serve all of her needs and still use all of the existing furniture. As important, or even more so, it's a rather unusual layout that gives the room a special look, making it differÂ­ent from most other teenagers' rooms. I hope she agrees it is no longer "useless," but a room that she will be proud to call her own. Readers with design questions may write to Susan Gill Spellmeyer, United Press International, 1400 Eye St., N.W., Washington, D.C. 20005. Because of the volume of mail, not all queries can be answered.